To say that La Voix Humaine is an opera for solo voice would be misleading and would be to deny the music its inherent character, or rather characters. In the absence of any physical figures on stage with ‘Elle’, the orchestral music of Poulenc’s opera (in our production the sparser, percussive piano) transforms into an omniscient narrator that both betrays her emotions and feelings, and on occasion acts as her accomplice. During panicked exchanges with the telephone Operator, the score exposes the heroine’s fear of not reaching her lover. The score becomes angular, quick-paced and erratic, evoking her fraying composure. When ‘Elle’ reminisces about the happier times they spent together, the slower, even sultry tempi are on her side, luring her lover back to those rose-tinted days. The score is equally complicit in painting her fictitious evening with her friend Martha, and pretending to her lover that she is coping. 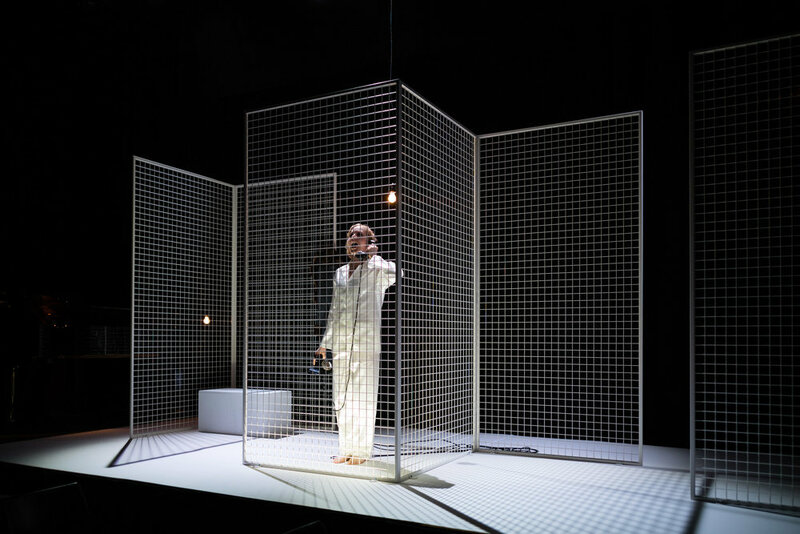 At these points, the score is particularly melodic, presenting the audience with another aural falsehood at odds with the visual reality on stage. This complicity between singer and score functions to create a heightened sense of insecurity. Uneasiness also stems from the piece’s fluctuating tonality. Her (Elle) speech-like patterns rise chromatically, broadly speaking, whilst the score beneath her jumps from motif to motif. There seems to be neither cohesive key nor melody to put the listener at ease. An important characteristic of Poulenc’s score, also serving to disarm the audience, is how he switches from the emotional to the physical. The ringing of the telephone penetrates the score seven times, becoming increasingly estranged from Elle’s vocal soundscape. At one point jazz bursts through the telephone, offering us a tangible image of her lover in a crowded bar, further isolating the lone ‘Elle’, with only the telephone connecting her to the outside world. The musical landscape Poulenc paints is ultimately deceptive. It serves initially to support Elle yet progressively works to destabilise her, leaving her isolated, with the score’s final notes, bare octaves, symbolic of her broken spirit. Despite expressing reservations about performances of La Voix Humaine with only piano accompaniment, Poulenc himself played the piano version in public on several occasions.